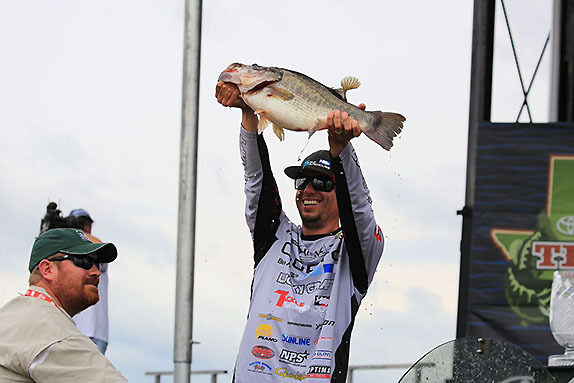 Defending TTBC champion Brent Ehrler has had a hard time locating a consistent pattern at Lake Ray Roberts this week. After a string of unseasonably chilly and windy days earlier this week, conditions are expected to improve for the start of the 10th anniversary of the Toyota Texas Bass Classic, now part of Toyota Texas Fest. This year�s tournament that brings together last year�s top point-getters from the Elite Series and FLW Tour will be at Lake Ray Roberts, located north of the Dallas/Fort Worth area. It�s the first time Lake Fork or Lake Conroe hasn�t hosted the event, but Ray Roberts also harbors big-fish potential, provided the conditions are right, and the presence of sunshine could position the fish tighter to the shallow cover that�s abundant around the lake and that could make them easier to target. Few of the 38 competitors in this week�s field had seen Ray Roberts before their two-day practice session, which wrapped up Wednesday. It�s loaded with standing timber and has a healthy amount of offshore structure, but given the lack of experience and short practice period, some went with the default mode and headed to the bank, where they found a wealth (maybe too much, according to some) of shallow-water targets in the form of water willow, buck brush and bushes. The water at Ray Roberts has been at full pool since last summer. Prior to that, it was down considerably and that allowed vegetation to sprout up along the shoreline. With the water now back up, it�s given the fish plenty of cover to live in and around. This week, however, the water has fallen a foot. Combine that with a cold front and strong north winds that knocked water temperatures down several degrees, and the fish have been tough to pattern so far. Most still expect the lake to produce plenty of big fish, but consistency will be a challenge. The consensus is that a 20-pound daily average will be in contention to win. The full field of 38 anglers will compete on Friday and Saturday with the Top 10 after day 2 advancing to the final round on Sunday. > Wildcard: A deeper-water hot spot where fish are grouped up. While Ray Roberts hasn�t been a regular stop on B.A.S.S. and FLW circuits, it�s a frequent tournament venue for Texas-based trails. Last weekend, it hosted the two-day championship for the Texas Team Trail and produced six stringers in excess of 20 pounds. Staying consistent was a challenge, especially on day 2, and 42.90 pounds wound up topping the field of nearly 130 teams. Larry Nixon (left) will be competing at Lake Ray Roberts for the first time this week. 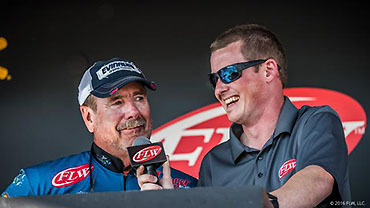 Stephen Johnston, a Hemphill, Texas, pro who has 13 Top-10 finishes in the Southwestern FLW Series since 2007, finished 3rd with partner Danny Iles in the event by targeting shallow bushes and flooded willow trees along the bank. Johnston says Ray Roberts is a unique lake compared to other Texas fisheries in that it has undergone some changes in recent years due to low water followed by sustained high water. �It�s a different kind of lake,� Johnston said. �There are a couple different ways to catch them there. It has a lot of big ones in it, but it�s a lake you have to grind it out on. It�s not a Toledo Bend or Guntersville or Rayburn. It�s a not a place where you�ll catch a limit in one area. You can catch one or two and then have to move on. One thing that hasn�t come and gone with the water level changes is the standing timber, of which there�s approximately 2,000 acres scattered up both major arms of the lake. There are stands of ironwood and bodark trees, Johnston says, that will be a factor this week. For the most part, though, a lot of fish are up shallow taking advantage of the cover that�s available in the form of willow bushes, but there will be some fish hanging around old house foundations, road beds and rock piles offshore. Johnston recalled roughly three years ago this spring Ray Roberts was 10 to 12 feet below normal pool. That allowed the willows to sprout up around the lake. Now, with the lake two feet high, the bass have an endless amount of shallow cover. They also tend to live shallow to avoid having to compete with the white bass and hybrid bass for forage out deep. Keith Combs is always a threat to win in Texas, especially after a Top-5 finish at Toledo Bend last week. �We�ve been fighting this wind. This is the first time I�ve ever seen it. It�s got a few fish in it, but the biggest things I�m having trouble with is whomever controls the lake levels on this lake � it�s been 2 1/2 feet high for months, but over the last 2 days it�s been dropping like crazy. It�s like they pulled the stopper on it. It�s making it interesting. �I have not located anything on the deeper, offshore structure and the water temperature has gone from 72 or 73 to 67. The water is still at a temperature where I don�t think the fish will be making a big push out. It�s a different kind of deal. I�ve caught a real quality fish so they definitely live here. I just think a guy�s going to have to put his head down and grind. �It�s been really cold for Texas in May. I�ve been in my full rain suit all day with wool socks on and I think it might get even colder. The water temperature is dropping, which isn�t normal for Texas in May and it looks like the water is dropping, but most of the fish seem to be shallow. This lake is shaped like Fork and looks like Falcon. �I spent time looking deep and fishing up shallow and it seems like you get more bites up there. Even with the water dropping, it�s still up in the bushes. I caught one (Wednesday) close to 7 (pounds), so there are definitely some big fish in here. It seems like each guy I�ve talked to has caught a big one each day so it seems to reason that somebody will figure it out enough to catch a couple of those each day. �I think the fish are confused. I�ve run all over the whole thing and haven�t figured anything out. I even caught a couple spots (Wednesday), plus it�s got a load of white bass in it. On Wednesday morning, I put a SideScan transducer on and idled around and found a school, but only caught big catfish out there, so we left. �I think they have to be piled up somewhere and a lot should change once the sun comes out. We�re supposed to get some rain Thursday and it seems like a lake that needs sun, especially with the high water. There�s so much shad as it is, I hope that once that suns get out it�ll put them tighter to the cover. �This is the first time I�ve ever seen it and I�ve never heard anybody talk about. I didn�t know much coming in and I don�t know much now going into it. I rode all over it and I know where I want to fish and just got enough bites to make me think I might catch one or two, but Wednesday I fished hard and only caught one keeper. That�s not good. �It�s been kind of tough. I caught one real big one Tuesday, but I�m not catching many and I�m not catching many big ones, either. It�s weird. I just like Fork better. I like how it sets up. Here, I don�t really know what to do. At Fork, I knew I needed to be out deep on a ledge. Here I don�t know where to go so I�m kind of confused. Kevin VanDam will be looking for his first TTBC win this week. 1. Keith Combs � He lives for this event � he�s won it a record three times � and he�s coming off a 4th-place finish at Toledo Bend so his confidence is starting to swell at the right time. 2. Edwin Evers � Offshore or near shore, the reigning Classic champion can compete anywhere. He�s also a fierce competitor and while there are no points on the line this week, a TTBC title would pair nicely with that trophy he won in March. 3. John Cox � With the fish up in the willows and bushes, he should be in his glory, able to fish shallow from start to finish. 4. Kevin VanDam � Fresh off his first win in more than 5 years, it�s possible he could be fixing to go on another of his tears. Ray Roberts would seem to favor his power-fishing mentality. 5. 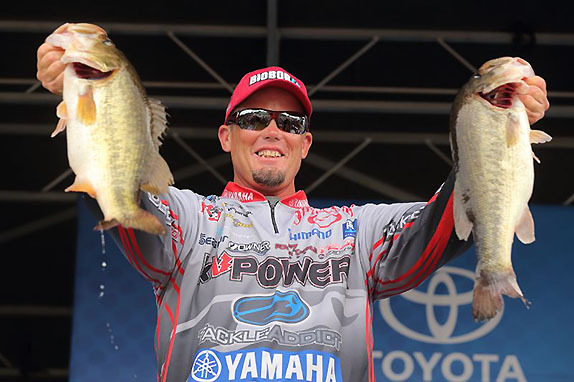 Bryan Thrift � He�s getting his mojo back after a disaster at Okeechobee. He�s won the TTBC before and his fish-the-moment approach could be an asset this week. > The tournament field was initially 36 when it was announced in early April. Since then, Brian Snowden and Kevin VanDam were added. Both were given sponsor exemptions � VanDam because he�s a member of Toyota�s pro team and Snowden because he was the only former champion not already in the field. He won the 2010 TTBC at Lake Conroe. VanDam�s name was curiously absent from the original field list even though he intended to compete all along. > Despite there being no slot limit on Ray Roberts like there is at Fork, anglers will weigh and release all legal fish on the water and be credited with the weight of their best five bass at the end of the day. Competitors will be able to bring one fish to the weigh-in site provided it�s 21 inches or longer. 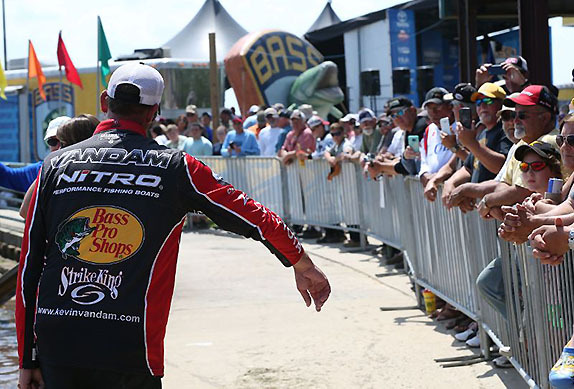 > Wesley Strader qualified via his finish in last year�s FLW Tour AOY standings, but he opted to compete at the Douglas Lake Southern Open this week as the berth in next year�s Bassmaster Classic he earned by winning the Lake Toho Southern Open earlier this year is contingent upon him competing in all three Southern Opens. Brandon Cobb took his spot in the TTBC field. > Anglers will launch at 7 a.m. CT all 3 days from Isle Du Bois State Park (100 P W 4137, Pilot Point, TX 76258). Weigh-ins on Friday and Saturday will begin at 5:30 p.m. at Toyota Stadium (9200 World Cup Way, Frisco, TX 75033). Sunday�s weigh-in will begin at 5 p.m. at the same location.